How much time does USCIS take to process an I-526 petition? The short answer: usually between 3 and 33 months. The rest of this post provides the long answer. How long does USCIS take to process a Form I-526 petition? For current estimates, see USCIS Processing Time Information. However, processing times can vary depending on the circumstances of each case. These include factors such as the time it takes to complete a background check and whether we need to request additional evidence. The report claims that “We generally process cases in the order we receive them,” and provides two pieces of information: an estimated time range, and a case inquiry date. We have posted a Case Inquiry Date … to show when you can inquire about your case. If your receipt date is before the Case Inquiry Date, you can submit an “outside normal processing time” service request online. From March 23, 2018 to May 18, 2018, the Case Inquiry Date for I-526 has remained constant: today’s date minus 971 days. (I spot check the webpage periodically, and log the reports in my IPO Times file.) The webpage claims that the report gets updated “around the 15th of each month,” but that has not been true yet. Average processing time is theoretically a function of inventory (number of pending petitions) and flow rate (rate at which IPO approves and denies petitions). You can get the input data for this equation from the USCIS Immigration and Citizenship Data page, which posts quarterly reports for I-526 and other forms. My I-526 Time spreadsheet turns the quarterly data into a prediction model that estimates average processing times as a function of petition volume at different points in time (with some assumptions about future trends). The last quarterly report indicated 24,627 I-526 pending at IPO in December 2017 and an average of 2,954 petitions processed per quarter over the last four quarters. 24,627/2,954 = 8.3 quarters to process the pending petitions (estimated average). So an I-526 petition filed in January 2018 would be theoretically likely to wait 8.3 quarters (25 months) for processing, other factors being equal. That’s consistent with the Processing Times Information page, which starts the Estimated Time Range at 25 months. But unequal reality leads to some petitions being processed more quickly. Here’s what IPO has said about I-526 time variation (summarized from communications copied in my log of IPO communications on processing times). DHS estimates that the average Form I-526 gets 6.5 hours of touch time. That means an adjudicator spends less than a day handling the case — the remaining (and most variable) processing time is queue time and time spent waiting for additional evidence or supervisory approval. IPO has at least three queues going for I-526 petitions: (1) a queue for direct EB-5 petitions; (2) a queue for regional center petitions based on investment in projects that haven’t yet been reviewed; (3) a queue for regional center petitions based on investment in projects that have Exemplar I-526 approval or previous I-526 approvals. The following chart illustrates my understanding of IPO Deputy Chief Julia Harrison’s description of the process. IPO indicates that each queue has dedicated staff working on it. Petitions within each queue are ordered by earliest filing date. A regional center petition for a project not previously reviewed must wait in Queue 2 (for project-specific adjudication) and then again in Queue 3 (for investor-specific adjudication). RC petitions for previously-approved projects advance straight to Queue 3. IPO encourages communication between team leaders on the Queue 1 and Queue 2/3 side to ensure that direct and RC petitions filed at the same time move forward concurrently. With this complex process, it’s unsurprising that IPO appears far from its intention to process cases more-or-less in the order in which they are received. Having an approved expedite request (this shortens the queue time, not the adjudicator touch time). EB-5 forms, like other immigration forms, can apply for and benefit from expedited processing under certain limited conditions. Expedited processing reduces the time a form takes to reach an adjudicator’s desk. It does not reduce the time to adjudicate the petition, and does not reduce the visa wait time for petitioners from countries with a cut-off date. Individual processing time variation means that some people wait longer than the theoretical average 25 months for I-526 approval, while others receive approval much more quickly. My best evidence for faster-than-average approval is priority dates for pending visa applications. If all I-526 take 2 years to process, then Department of State should have been receiving applications in 2017 from people who filed I-526 in 2015. In fact, as of October 2017 Department of State reported having over 1,500 pending visa applications based on I-526 petitions filed in 2016 and 2017. Assuming an average 3 visa applications per approved petition, that reflects about 500 I-526 petitions approved and advanced to the next stage within a year of filing. And the DOS report only mentioned pending applications for five countries, not counting all applications for the year. I-485 inventory statistics likewise show many pending status adjustment applications with recent priority dates. I set up a Google Form to collect reports of processing time experience from individual investors. (Entries still welcome!) In the very limited sample of entries so far (which appear in this Google Sheet), I-526 approvals in 2017/2018 that were reported to me had an average processing time of 19 months, with standard deviation of 7 months. The following tables summarize results reported in my Form so far. Some blog readers have set up a group using the Telegram app to share I-526 experience. I’m not on this myself, but I hear that discussion has been lively. Here’s the link to join: https://t.me/EB5VisaGroup If you know of other social media for EB-5 investors, alert me and I’ll publish links here. Here’s my I-526 Time spreadsheet with data and prediction tool, and my log of communications from USCIS regarding processing times. Keep the links; I update the files regularly as new information becomes available. My post I-526 and EB-5 visa wait times; country-specific effects of potential changes (June 18, 2018) examines the separate question of the time to get an EB-5 visa (conditional permanent residence). My series of timing posts is missing an important piece: analysis of the steps and time factors (for countries with no cut-off date yet) between receiving the Form I-797, Approval Notice for the I-526 and claiming an EB-5 visa number. Especially Indians are trying to calculate: if I can count on receiving I-526 adjudication in the next few weeks, can I count on getting allocated a visa number in the advance of the Visa Bulletin giving a cut-off date for India? The point at which the visa number actually gets allocated, and the factors/timing between I-526 approval and that point, vary between I-485 and consular processing, and I don’t understand it all yet. But potential investors should include this in discussions with counsel, because delays can be considerable for consular processing anyway. I’m hearing reports of USCIS taking 8+ months just to forward I-526 approvals to the National Visa Center. Ironically, it seems that the faster USCIS adjudicates I-526, the more it drags its feet on advancing that approval to the next stage. But this is a developing situation, and I have limited examples. Here is my background reading list so far FYI. Please email me any additional helpful articles and current timing information. Looking at the May 1st I829 stats, the number of Denials is currently denied (D). However, when looking at the number of petitions received and adding it to the previous amount, then subtracting the approvals, it comes to around 200 which if true would be a denial rate of around 20%? Huge increase. I didn’t do that equation to calculate denials because in the past, previous quarter’s pending plus receipts minus denials has never equaled quarter-end pending petitions. Not sure why this is so. (See this file https://www.dropbox.com/s/8mwqwwh5eos0j96/PendingCalc.xlsx?dl=0) FYI in the past, “D” has been replaced in subsequent quarters by a trivial number of denials. They have just updated the I829 times and moved it much further back. Its now taking 3 years and 2 months! Wow! And at the same time, they abruptly shaved 5 months off the estimated I-526 time. Who knows what reality this reflects? Reallocating resources to I-526? Drop in I-526 receipts and increase in I-829 receipts? I’m hoping it should have said 2016, not 15! It’s a possibility! They changed the date range for I-829 too, though, putting the “outside normal” month at 37.5 months (!). So I’m afraid we can’t theorize a single typo. I find it strange that the I-829 processing date could suddenly move back by six months…so am hoping this is a glitch while they will rectify soon…otherwise, this is really bad news for those of us waiting for our permanent Green Cards! True, though this would mean that the “Case Inquiry Date” is just a theoretical derivative based on the workload on that particular day, and not the actual cut-off date of the earliest application they are processing at the moment. Whether there is a sudden surge in receipts or a slowdown in processing, logically, this earliest date should not change, or move back, if processing of applications is supposedly done as they are received. But we have seen that happen so many times in the past, in their earlier format of reporting. All very confusing, and only adds to the anxiety! I agree Andy, it shouldn’t move backwards unless it is using the previous month and dividing. I’m a year down the i829 route and the thought of having to wait another 2 years is not pleasant! Thanks for all the information. When do you think we should start worrying about processing time? My case for i-526 was received on September 29 2015… haven’t heard anything back yet. What do you think? This petition is definitely overdue for processing. 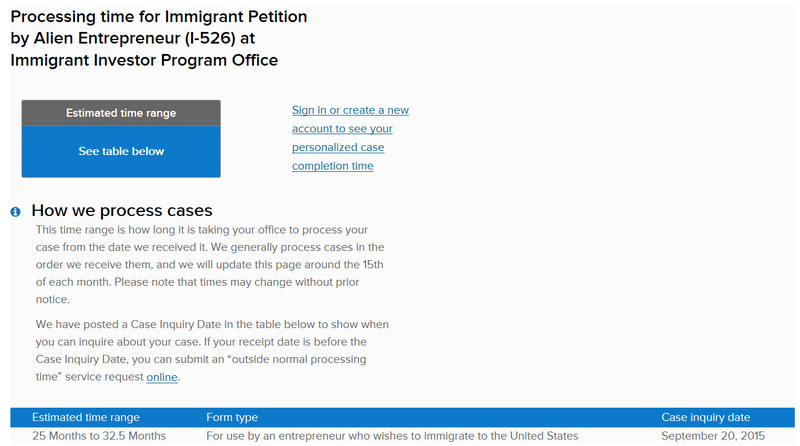 The USCIS Processing Times page now gives a case inquiry date of May 2016, which means that “If your receipt date is before the Case Inquiry Date, you can submit an ‘outside normal processing time’ service request online.” Here is the link to ask USCIS directly what’s going on with your petition: https://egov.uscis.gov/e-request/Intro.do. The lawyer who filed your case may be able to advise on the inquiry process. Thank you very much for your response. We’ve been going through the inquiry process but the whole thing seems to be maddening. All we’ve ever gotten back is that it’s currently pending with the program office. What steps would you take in this position? Thanks for sharing your knowledge. In the same project among all the investors, do investors who filed the applications first always get approved first? I’m asking this because no one in my project hasn’t gotten approved yet and my priority date is now past the date listed on the USCIS website so I can technically file a case inquiry. I have talked to my lawyer and he suggested to only do a case inquiry after someone gets approved first. But that implies that the USCIS review applications in the same project in the order of when the applications were received, and I wonder if that is the case.